The recent Michelle Williams controversy has rekindled talk of the Indian-Oz connection. In that context, someone mentioned that L. Frank Baum's mother-in-law was a Native rights activist. 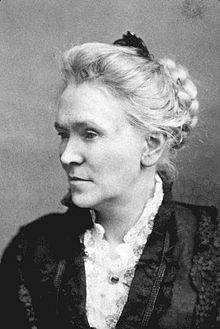 Matilda Joslyn GageMatilda Electa Joslyn Gage (March 24, 1826–March 18, 1898) was a suffragist, a Native American activist, an abolitionist, a freethinker, and a prolific author, who was "born with a hatred of oppression." Gage was considered to be more radical than either Susan B. Anthony or Elizabeth Cady Stanton (with whom she wrote History of Woman Suffrage). Along with Stanton, she was a vocal critic of the Christian Church, which put her at odds with conservative suffragists such as Frances Willard and the Woman's Christian Temperance Union. Rather than arguing that women deserved the vote because their feminine morality would then properly influence legislation (as the WCTU did), she argued that they deserved suffrage as a 'natural right'. Gage was well-educated and a prolific writer—the most gifted and educated woman of her age, claimed her devoted son-in-law, L. Frank Baum.And:Works about Native Americans in the United States by Lewis Henry Morgan and Henry Rowe Schoolcraft also influenced Gage. She decried the brutal treatment of Native Americans in her writings and public speeches. She was angered that the Federal government of the United States attempted to confer citizenship (including suffrage) upon Native Americans (who, Gage argued, opposed taxation, and generally did not seek citizenship) while still withholding the vote from women. She wrote in 1878:That the Indians have been oppressed--are now, is true, but the United States has treaties with them, recognising them as distinct political communities, and duty towards them demands not an enforced citizenship but a faithful living up to its obligations on the part of the government. By Sally Roesch WagnerAs a child during the 1830s, she circulated anti-slavery petitions. Gage's entire life was spent within a thirty mile radius of Syracuse, New York, and her home, like that of her parents, was a station on the underground railroad. As a young wife and mother in 1850, Gage signed a petition stating that she would face the penalty of a six month prison term and a $2,000 fine rather than obey the newly enacted Fugitive Slave law, which made criminals of anyone assisting slaves to freedom anywhere in the United States. During the 1870s, Gage wrote a series of controversial articles decrying the brutal and unjust treatment American Indians had received. Having already broken numerous treaties, the government was trying to force citizenship upon Native Americans, she argued, thus destroying their independent nation status, and further opening "wide the door to the grasping avarice of the white man." Gage, who was adopted into the wolf clan of the Mohawk nation and given the name Ka-ron-ien-ha-wi (Sky Carrier), wrote of the superior form of government practiced by the Six Nation Iroquois Confederacy, in which "the power between the sexes was nearly equal." This indigenous practice of woman's rights became her vision. Maud's two sisters and brother were in the Dakota Territory. Because Maud wanted to be near them, she insisted over Frank's vacillations that they move there. Maud, Frank, and her two sons moved to Aberdeen, South Dakota, on September 20, 1888, because Frank believed there would be better business opportunities in the West. Frank started a dry goods store, Baum's Bazaar, on October 1, 1888, to make a stable living for his family. However, because he granted too much credit to his destitute customers, his store went out of business. The family moved to Chicago, and Frank found a job as a newspaper reporter. Maud's mother Matilda frequently spent the winter at their house, as she did when Maud and Frank were residents of Aberneen. Maud cherished her mother's visits, especially when Frank traveled for his job.Comment: I posted about the connection between feminists and Indians in Women and Indians as Peacemakers and Indians Inspired Feminism. But I didn't realize Gage was Baum's mother-in-law. So Baum was devoted to Gage the Native rights activist. She stayed with him and Maud during the Aberdeen winters. This was when he wrote two virulently anti-Indian editorials for the Aberdeen Saturday Pioneer. I wonder what they said to each other the day after the editorials appeared. For more on Baum and Indians, see Indians = Flying Monkeys? and Lakota Protest Baum's Editorials.